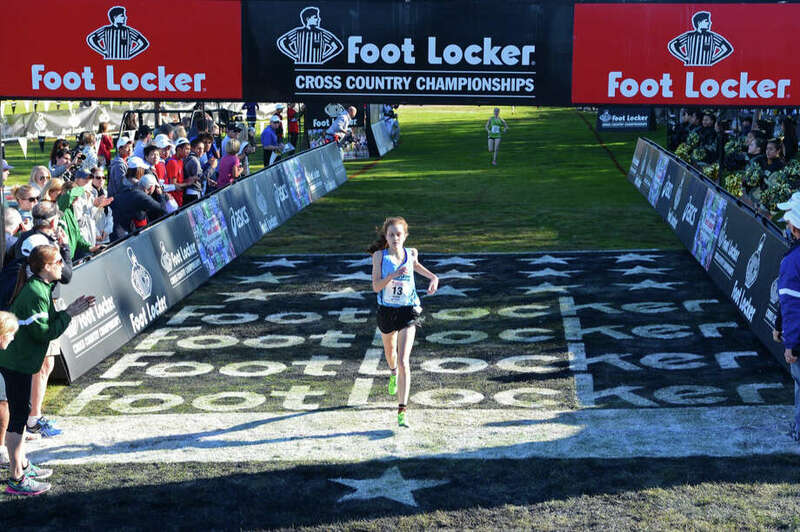 Hannah DeBalsi crosses the finish line at the 2013 Footlocker Cross Country Finals San Diego on December 14, 2013. DeBalsi finished in second place, earning All-American honors. Staples runner Hannah DeBalsi began the 2013 calendar year as a relative unknown -- a freshman coming off a solid cross country season that included a trip to the New England championships. By the time 2013 ended, the entire high school running community was familiar with the rising star. On Saturday, DeBalsi was named the Hal Levy High School female Athlete of the Year by the Connecticut Sports Writers' Alliance. Southington quarterback Stephen Barmore took home male athlete of the year. DeBalsi won titles in the 2-mile in indoor and cross country at the State Open, while finishing second in the outdoor State Open in 2013. DeBalsi finished 10th (10:39.28) at the New Balance indoor nationals in the 2-mile last March. She followed that up with a third at outdoor nationals in June in the same event. Her time (10:16.20) was the fastest time ever run by a freshman in the event. The sophomore finished off 2013 in style, finishing second (17:26) at the Foot Locker cross country nationals in December.